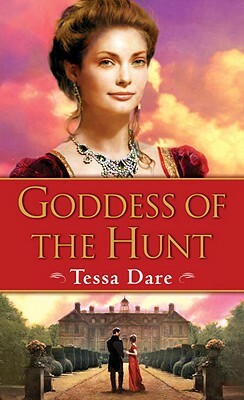 In this lush and seductive novel, exciting new author Tessa Dare takes desire to brazen heights. Ever the bold adventuress, Lucy Waltham has decided to go hunting for a husband. But first she needs some target practice. So she turns to her brother’s best friend, Jeremy Trescott, the Earl of Kendall, to hone her seductive wiles on him before setting her sights on another man. But her practice kisses spark a smoldering passion–one that could send all her plans up in smoke. Jeremy has an influential title, a vast fortune, and a painful past full of long-buried secrets. He keeps a safe distance from his own emotions, but to distract Lucy from her reckless scheming, he must give his passions free rein. Their sensual battle of wills is as maddening as it is delicious, but the longer he succeeds in managing the headstrong temptress, the closer Jeremy comes to losing control. When scandal breaks, can he bring himself to abandon Lucy to her ruin? Or will he risk his heart and claim her for his own? Tessa Dare is a part-time librarian, full-time mommy, and swing-shift writer. She makes her home in Southern California, where she shares a cozy, cluttered bungalow with her husband, their two children, and a dog.